I was jostling a bit with the runners around me to try and find an easier path up the grassy incline. Head down, working hard, I suddenly I heard Eric cry out ‘Good start, Simon.’ What he didn’t know was that although barely a minute of the race had elapsed, I was already heading into the red! I’d decided to do the Great Whernside fell race on a bit of whim. 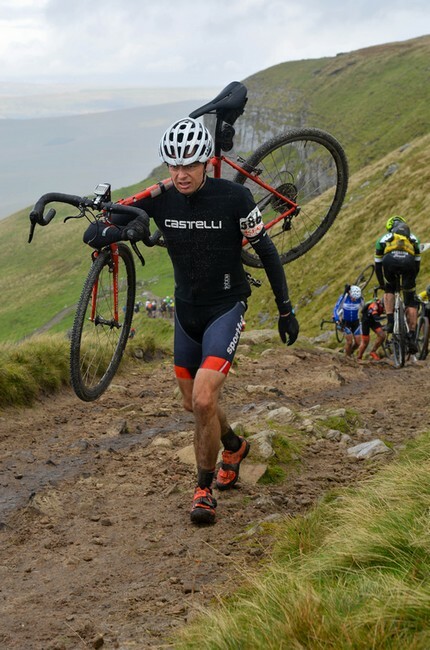 Having read a few fell running books over the years (‘Feet In The Clouds’ and ‘Mud, Sweat and Tears’ being two of the best) I’d long fancied having a crack at a race and doing the 3 Peaks Cyclo-Cross piqued my interest even further. 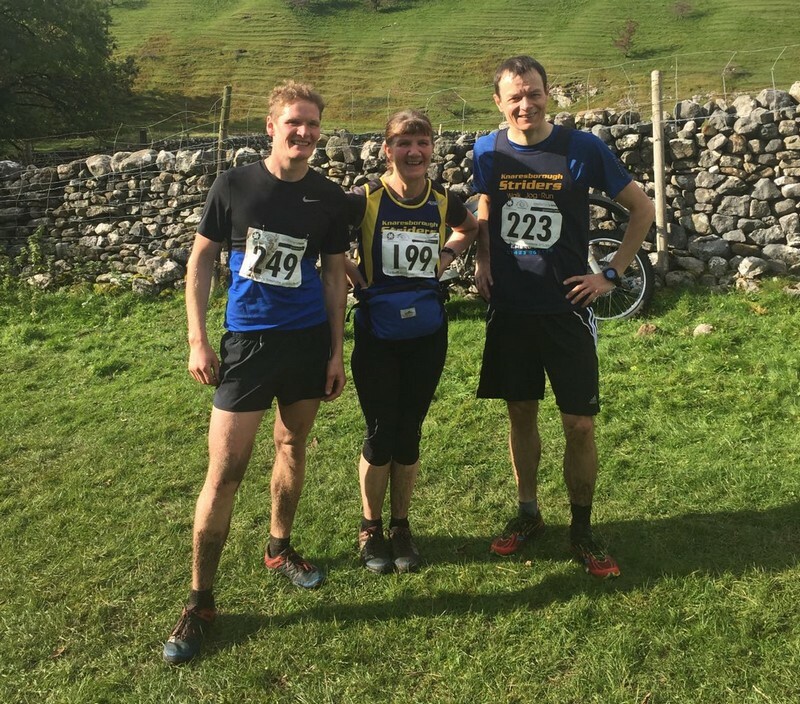 So, I joined the FRA (Fell Runners Association), received the handbook on Thursday and saw there was a race in Kettlewell at the weekend. It was rated category A, the hardest, but it was only 4-miles so how hard could it really be!?! The answer to that question came as soon as I saw the start. There was no preamble, no easy run in, instead the start line had just been positioned at the very foot of the climb. And that climb was steep! Thankfully after about a kilometre the gradient eased, I recovered a little bit and began to get into some sort of a rhythm. It wasn’t quick and it surely wasn’t pretty, but it was sustainable…mostly! The hillside then kicked up sharply again through some rocks, after which there was a long boggy false flat and then some steps that lead to the final grassy push to the summit. I’d just begun that last leg up when James Warburton came flying past me on his way back down. Different class. The descent simply reversed the route up and it was fast, though not as rapid as some of the hardened fell runners around me. While I had to pick my way down the steeper sections, they just bounded down like gazelles. It’s impressive too see how quickly it’s possible to descend with the right technique. Happy to have finished without mishap, I met up with James and Charlotte and not long afterwards Sue came barrelling past us down the fellside. A seriously impressive run. For such a short distance this race was tough, but it was also a lot of fun. 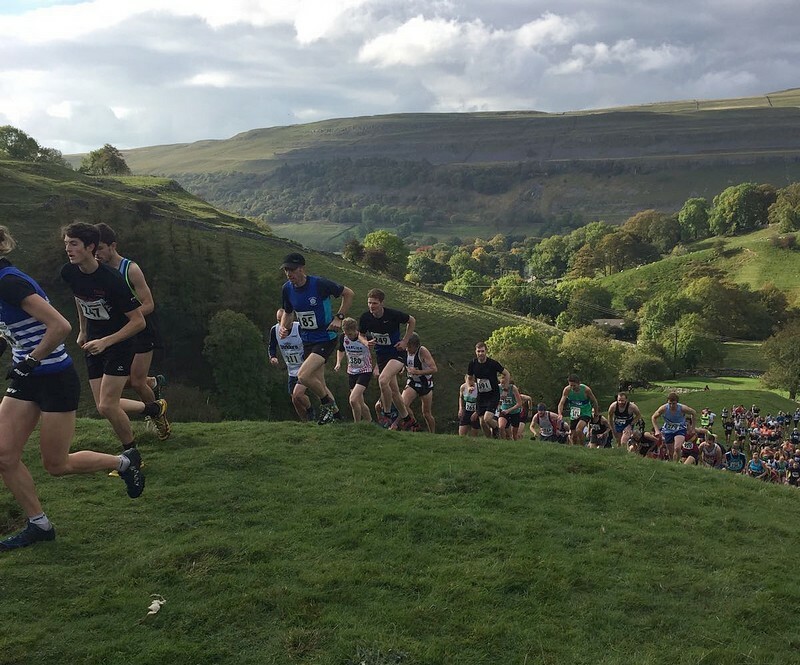 If you fancy a change running on the road, there are several good reasons to enter a fell race; there’s something old-school and pure about it, the atmosphere is friendly, the terrain is varied and the scenery is stunning. Perhaps more importantly though, the post run endorphin high is definitely a category A! Hands covering the brakes, I watch out for other riders while trying to scan the wet ground ahead for the best line to take. Suddenly my front wheel sinks into a bog and stops dead. But I don’t. I go over the bars and face plant straight into the peaty mud. The rider behind me bursts out laughing. Fortunately for me it’s a soft landing, because this is the descent of Ingleborough and there are still two more peaks to go. The 3 Peaks Cyclo-Cross race has been going since 1961 and though the rules and route have been tweaked over the years, it’s always been an annual cycling smash-fest over Ingleborough, Whernside and Pen-y-ghent. 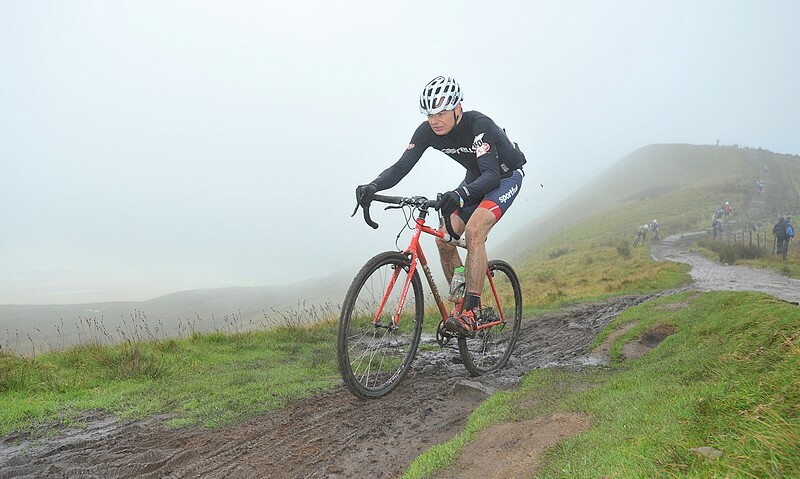 It’s often dubbed as the toughest cyclo-cross race in the UK and has also been described as a fell race with a bike to slow you down on the climbs and to speed you up (and scare you) on the descents. One of the lucky 650 to get a place on the start line, I’d been really looking forward to the race and had put in a few decent training sessions, which consisted of multiple bike carrying reps up The Chevin. Unfortunately, that training was then significantly curtailed due to two minor accidents. The first being a banged up shoulder from a trip over the handlebars after running out of talent when bunny-hopping an obstacle! 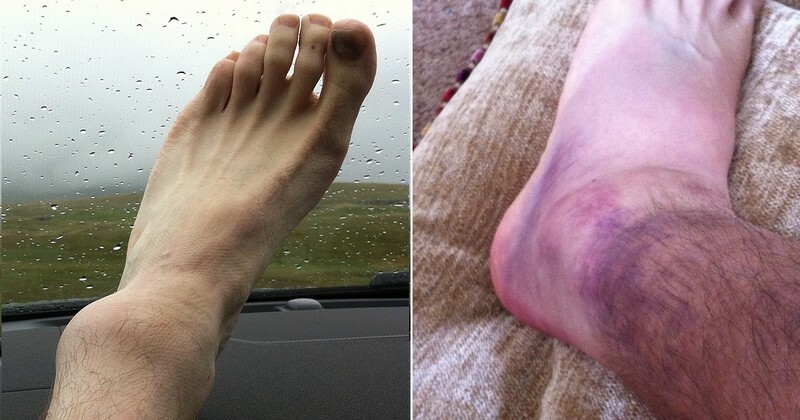 The second was a sprained ankle after hitting the deck while doing a running recce of Whernside three weeks before the race. What a d**k! Thankful just to make the start after such fitful preparation, my primary objective was now simply to get to the finish. Thoughts of a time around 4-hours had been largely banished…and were completely extinguished by the top of Ingleborough! My ankle was holding up, but twinges of cramp in both quads meant that I was already in survival mode. The rest of the race was incredible. The ascents were steep and descents were tricky. There was rain and there were some hailstones. The wind on the top of Pen-y-ghent was so strong it was a struggle to keep the bike from being blown off my shoulder. The cramp, which had begun in my quads, spread to muscles in my legs that I didn’t know I had! At several points during the race I really had to dig deep. Then almost suddenly, after 4-hours, 33-minutes and 59-seconds of effort and intense concentration, it was all over. I’d finished the 3 Peaks. I could barely stand, but I’d absolutely loved it. The terrain, the history and the sheer lunacy of it all combine to make this a very special race. This 54th edition was really well organized and the marshals were efficient and encouraging. Two people though deserve very special thanks: my sister, who stood out in the wet and cold to hand me water bottles before and after Whernside. And the lady in the white VW van that drove past on the road to Horton and handed me some jelly babies out the window. Saviours both. I really hope I get a place again next year. After a damp start to the day, drier and milder weather greeted 26 Striders for the latest Time Trial event on Thursday evening. The third and final TT of the year was a handicap event, with all those who had run at least one of the previous two events in 2015 setting off in order of times previously set. Thanks to Eric for organising the event and to all of the volunteers that helped on the night. 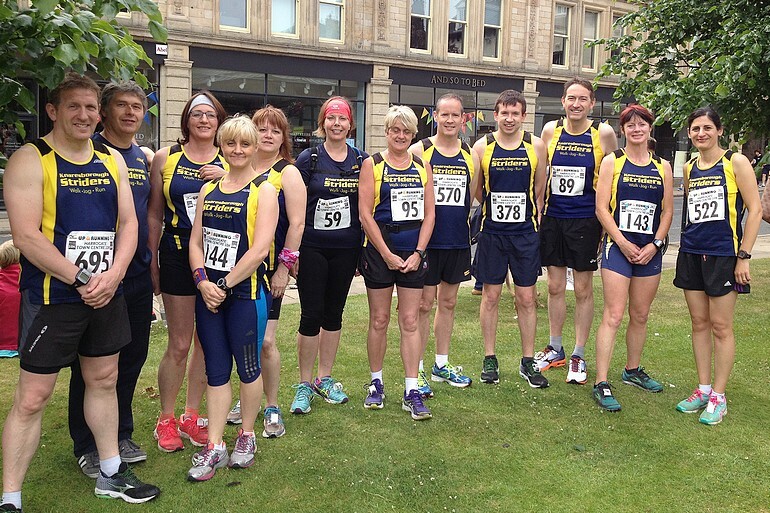 A bumper set of results this week, with Striders represented at 5 different events. Starting with parkrun on Saturday morning, regular Fountains Abbey visitor Phil Chatterton recorded a time of 22:10. At the Harrogate event, Gareth Conkleton achieved a PB with a time of 22:15. He was joined by Julian Carr (23:12) and a PB smashing Graeme Kilvington (23:27). At the Brownlee Triathlon, held at Harewood House, Andy Robinson finished 78th out of 730 with a time of 01:40:08. A slight detour on the run section of the event cost him a higher placing but he won’t be making that mistake again he says! Dan Wilson was also competing in the event via participation in the team relay. He took on the running leg and helped his team to finish in 10th place. A cold start to Sunday morning didn’t put off a healthy number of Striders attending the latest Club Championship event – the ‘Kirkstall Abbey 7’. Martin Brock was first back into the Abbey grounds, leading home the 11 members in attendance ,with a time of 42:25. Also getting some points on the board for the championship were James Wright (44:50), Guy Close (46:08), Ian Mitchell (47:15), Conrad Garcia (47:46) Nicola Carter (49:37 – First FV45), Julian Carr (53:19), Andrea Price (01:04:46), Lucy Cartwright (01:05:47), Joanne Fowler (01:06:35) and Dawn Richardson (01:09:03). At the fast and flat Redcar Half Marathon, Sima Lowery continued her great recent race form with a finish time of 01:40:17. She was joined by David Cremins (time TBA) at the 33rd running of the event. On a warm night for running, 9 Striders visited the village of Sessay, near Thirsk, to take on the flat 6k course of the ‘Sessay Swift’ event. Martin Brock led home the Striders contingent, finishing in 22:47. The next 3 members across the line were tightly packed and split by only 9 seconds. Andy Robinson, registering a time of 23:26, was chased down by James Wright (23:30) and Dan Wilson (23:35). The ever improving Sima Lowery (26:18) was first women back for the club, just beating Nicola Carter (26:22). Dawn Richardson and David Sowery crossed the line together with times of 35:46, with Brenda Grant also achieving a great time of 37:23. The Stray Fun Fair didn’t bring a stop to the Harrogate parkrun, with 6 Striders visiting. Ian Mitchell was first back from dodging the dodgems with a time of 21:36. On a good morning for running, Ian was joined by Nicola Carter (22:15), Julian Carr (23:25), Anthony Everitt (28:16), Brenda Grant (32:27) and Tracy Allison (33:16). Well done to Julian for completing his 50th parkrun (visiting 7 different events along the way!). A number of Striders undertook some ‘parkrun tourism’ this weekend. Edna Wood visited the Skipton event, finsishing her second parkrun in 28:54. Fountains Abbey, which will welcome a large contingent of Striders this coming Saturday (5th September), was visited by Guy Close (20:42) and Conrad Garcia (21:16). A day after completing a Coast to Coast bike ride (madness!! ), Andy Robinson recorded a time of 20:46 at Northallerton. A reminder that a club visit to FOUNTAINS ABBEY parkrun will take place this Saturday (5th September). The event, widely regarded as the best parkrun in the country in terms of location (a World Heritage Site) and scenery, is a predominantly flat course starting adjacent to the Abbey and is run over two laps (one short and one long towards the Water Gardens). Please meet at Knaresborough Cricket Club for 07:55am, with departure at 08:05am to make sure we are there in plenty of time for the 9am start. If coming to KCC first means you are travelling in the wrong direction, please feel free to meet us there. If you can make the event, please put your name down on the sheet which you will find on the club noticeboard at KCC. Alternatively, let us know via email (info@knaresborough-striders.org.uk), Facebook or Twitter. Please indicate if you can take a car or if you will require a lift (or if you will be meeting us there). On a warm night for running, 36 members took on Eric’s second Time Trial of the year. It was great to see a number of new runners down at the club and fantastic to hear of the improvements people had made since the first time trial. A BIG thanks to all the volunteers who made sure the event ran smoothly!